“True, not true, fact, fiction, legend, Only Jimmy and maybe I know. Imagine being 16 years old, in love with cars and anything to do with Drag racing. Imagine living just a couple miles away from Woodward Avenue in the suburbs of Detroit. Imagine that it is 1968, the explosion of muscle cars from the Big 3 are hitting the streets of Detroit. On top of all that imagine you work at the Sunoco gas station on Woodward Avenue just north of 14 mile Road in Birmingham, Michigan pumping 260 gasoline into almost every muscle car and hot rod that was cruising Woodward on a Friday or Saturday night. Oh, did I mention that the Sunoco station was owned and operated by Jimmy Addison the builder and owner of a certain 1967 Plymouth GTX fondly known as “The Silver Bullet”. Sounds like a job some kid would dream up after reading the latest Hot Rod magazine. It might be except the kid was real, the job was real and that kid was me. Of course being 16 years old and totally engrossed in everything around at that time I had no idea I was right in the middle of what would become not only a part of automotive history but also street racing legend. How do I come to write about this now? 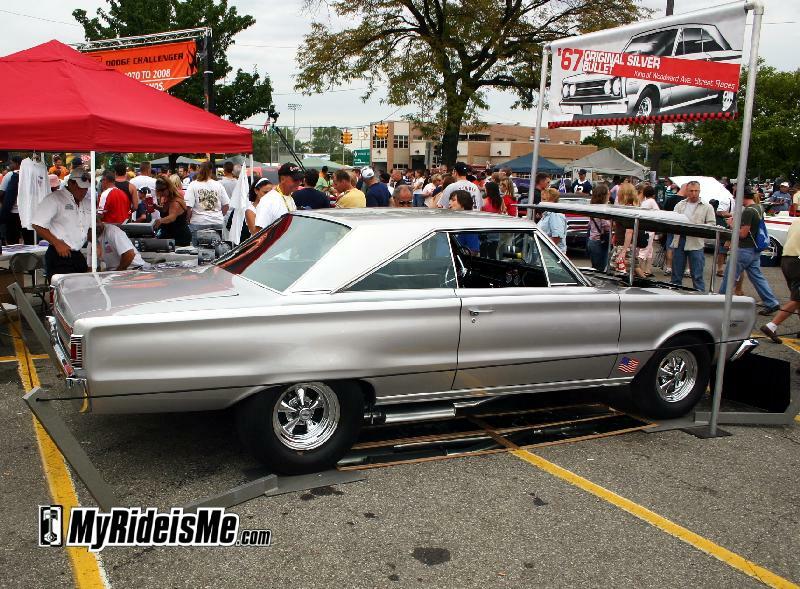 Last year was my first Woodward Cruise and like a lot of people I saw the two cars that were supposed to be Jimmy’s Silver Bullet GTX. However, one person had the car, another had the engine. It had been years since I’d seen the Bullet. And, I just recently heard of the death of Jimmy Addison. All this made me want to remember and talk about those times now that I have some perspective about what I was actually in the middle of back then. So, who am I and how did I get that dream job for 16 year old car nut. I actually had a pretty close connection to Chrysler racing myself. My father, Brian Schram, was the manager of Chrysler Performance Parts back then. Actually he started the Performance Parts Department in the very early 1960s and ran it until 1988 when it was still known as Direct Connection and he retired. He found me my first job in cars back then. But oddly enough it was not Jimmy’s Sunoco station on Woodward. My first job was working at a Gulf station 2 blocks east of Woodward on 14 Mile Road. But this is where you see the rare opportunity I had back then. The Gulf gas station was owned by Ted Spehar. If you don’t know who Ted Spehar is maybe you have heard of another car called the “Motown Missile”. Though the Missile had yet to be thought of or built back then there were other cars that were quite famous being built and raced by Ted. The car Ted was building then was the “Iron Butterfly”, a 1964 Super Stock Hemi Dodge driven by Wally Booth at the time I worked there. But school was starting soon and though I was working full time for Ted that Summer I could not work full time during high school. So I may have been involved the first trade in racing history. I was traded to Jimmy Addison where I could continue to learn about engines and cars and be able to work evenings and weekends. And, someone who was not in school any more and working for Jimmy was sent to Ted’s new shop in Royal Oak to work full time. Sound’s pretty wild when I write about it now! But let’s get back to the Sunoco station. What did I do back then working for Jimmy Addison? Basically I was the “grunt”. I pumped gas, I cleaned the bathrooms, I cleaned Jimmy’s tools and washed the service bay floors. However, those things did not take up all of time, so in between the cleaning and pumping I was taught about engines, cars and racing. I’ll kindly BEG Paul to go on. Please encourage him by adding any info you might have and if you’ve got some vintage pics of the “Iron Butterfly” or the “Mowtown Missile”, please let me know. NIce. I grew up in Detroit’s NW corner, turning 16 in 1970. Telegraph was closer, so it was easier to catch action there, usually without even trying. Always a treat to head to the Eastside to go woodwarding though. I’m Paul’s Dad, I have always been proud of Paul, When he was working for and with my friends and co-workers, he never let me down. In 1968 I lived in the neighborhood also. I had a 66 GTO that you would remember at Jimmy’s Sunoco. At that time I worked with Bob Felt and Joe Fitzpatric at the Gulf Station (13mi and Greenfield) owned by Ken Smith. I was 18 in 1968. I also ran Presto Auto Wash next to Big Town Restaurant. We hung around at Jimmy’s to get our 260 gas and then head to Totem Pole. Yes the memories were great. I now live outside Las Vegas in the town of Overton. Any one remembering me PLEASE email!!!!! I can remember standing at the front door at jimmy’s sunoco watching them unload jimmy’s new dodge truck from the factory. Jet black half ton short bed hemi hurst line lock and all the goodies straight from the factory. The first thing he did was put it up on the hoist. I think Kenny DeMire was also there.